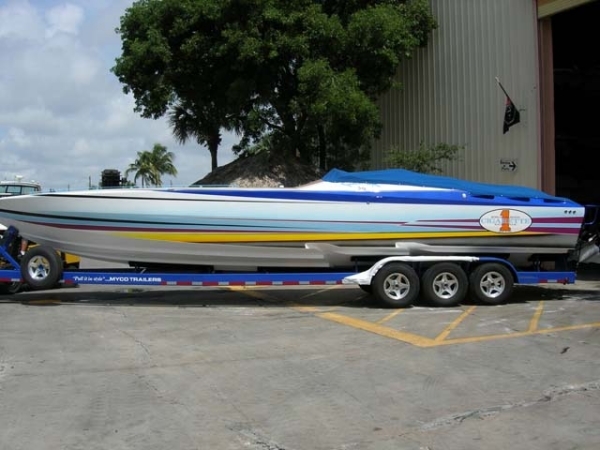 I have seen this boat up close and it is MINT! Attached is the before pic.. I had a feeling it was the DollaBill customized '05. Ugh . DollaBill leased that boat for a time. During that time, it was "customized" by being introduced to a toll booth--intimately; down one side of the boat while on the trailer. ...or so the prop turns. This is actually my friend's boat, he bought it already upgraded at Lipship. Is your friend the infamous Victor the cheese man? My friend is "Steve the body shop guy". This boat could've hit 10 toll booths and wouldn't matter cause it looks brand new. So don't believe the haters in the post, it is exactly what it looks like. Beautiful and flawless! No hate here. I kinda dig the all business aspect of them; even had some time behind the wheel of the OSO Gladiator. Not hatin' at all. It was a cosmetic little scratch(es). It's just the DollaBill part that makes humorous. That thing was pretty before, looks awesome now. [QUOTE=Cash Bar;3937922]Not hatin' at all. It was a cosmetic little scratch(es). It's just the DollaBill part that makes humorous. That thing was pretty before, looks awesome now. 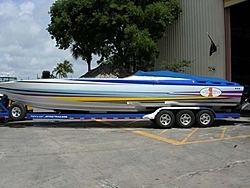 [/QU.its all good, the boat is beautiful, wish I could afford to buy it. Its for sale right now. Pretty before? Now that is sugar-coating it.Whoever authorized the original colors (especially the cockpit) built a disaster. The re-do looks very nice.